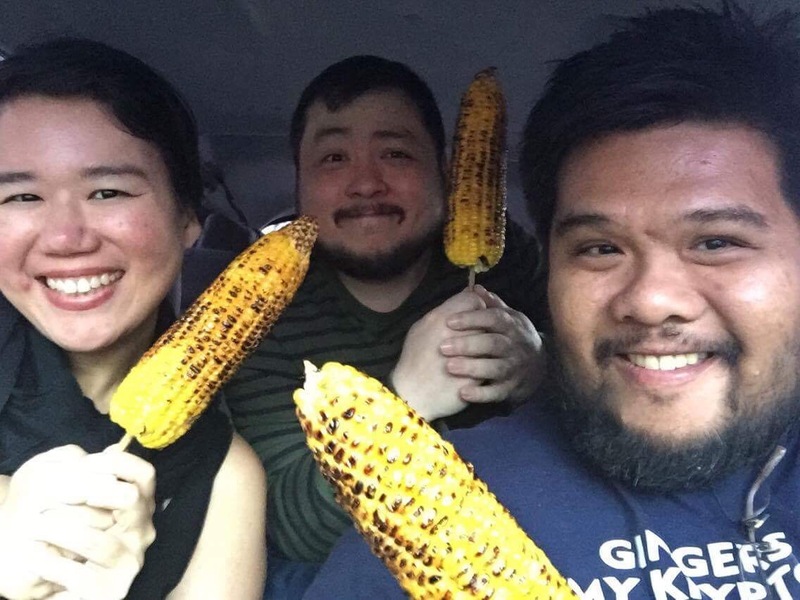 Left to right: Me, Toto, and Ian with our roadside corn. A couple of friends–distant cousins Ian and Toto Carandang–and I were driving home. Rather, Ian was driving and using Waze to navigate Manila’s awful traffic. The app had taken us to the bowels of Pasig. We had no idea where we were. We’re kind of sad that way. Ian and Toto were talking about how hungry they were getting when Toto and I interrupted the conversation by yelling “Corn!” at the same time. We had both seen the same guy selling fat cobs blackening on the grill, a mountain of unshucked corn behind him. Ian stopped the car and Toto and I get down and order three pieces. They cost Php20 each. We waited about five minutes for the corn to cook. The vendor brushed a thin coat of butter and sprinkled a bit of salt on them before handing them to us. He said they were from Nueva Ecija. The corn was soft and warm and sweet, a delicious diversion to the rush hour traffic jam and a wonderful memory between friends. Pingback: Sisig, Halo-Halo, and Carrot Cake: A Tiny Tour of San Fernando and Angeles, Pampanga – nope.